How did the NY Giants lose? On Sunday the Giants lost to the Philadelphia Eagles in Lincoln Financial Stadium. This may not take you by surprise since they have lost 12 of the last 16 games vs. the Eagles, dating back to 2011. However, Sunday was different. The Giants were on a 2 game winning streak and the Eagles were ravaged by injury. Carson Wentz was rattled over the last few weeks and the New York Giants seem to be clicking at the right time to salvage the season. Or at least, win a few games and put some joy into watching the NFL and the Giants again. That was before Eli tossed up an interception moments before halftime. It clearly looked like Eli and Shurmur were force feeding the ball to Odell down the middle of the field who at the time…wasn’t open. Time and time again Head Coach Pat Shurmur shows his ignorance with in-game execution. Eli gave away an easy 3 points way. Dumb play call and terrible execution. Lets not even talk about the “time out” and screen to Gallman that followed. Despite the typical Eli Manning dopey play, the Giants were winning. Yes, I said it, “winning” by the score of 19-3. Saquon Barkley and Eli Manning dominated the 1st half. Saquon Barkley – 9 att/94 yards rushing/ 1 TD. 33 rec/1 TD. After the half, Barley only contributed with four additional carries and seven additional yards . Yes…seven yards in the entire 2nd half. The Giants star running back didn’t even play on the second drive of the second half after the Eagles had mounted a serious comeback and cut the lead to 19-14. The Giants lost 25-22. Fans, Players and analysts want to know what happened? What NFL head coach would sit his star player when trying to win a football game. Why would Shurmur “ICE” one of the best backs in the NFL while he was in the process of having a career day. What NFL head coach would stop throwing to Rhett Ellison who was also on the way to having a career day (4 rec/77 yards). Two of the most exciting plays were from Manning to Ellison. The first was a beautifully placed Manning ball between 4 defenders for an 18 yard gain on an Ellison seem route. The second came with five minutes left in the half when Manning executed a perfect rollout hitting the big Tight End in the flat. Fans watched him rumble for 28 yards. Every NFL head coach that wants to win would continue to feed Barkley and Ellison until they turned the lights out in the stadium. Unless Shurmur didn’t want to win? 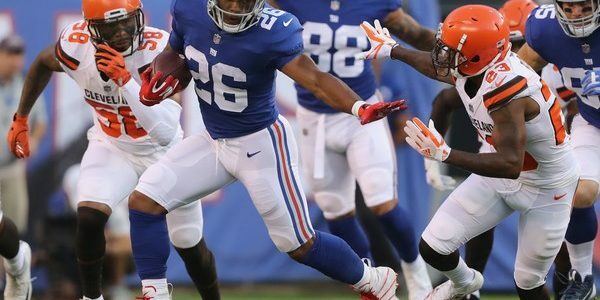 Is it possible that Mara and/or Gettleman told Shurmur to cool it, slow down production because the New York Giants brass have decided they want the best draft pick possible? Did Gettleman tell Shurmur that this season is a wash and they will be looking to the NFL draft for Herbert, Grier, Lock or Bosa? And as we know, NFL teams don’t “TANK”. Players get hurt that way, but management can alter the play calling and sit the most effective players. Barring an injury…what other reason would any coach have for removing the most dynamic running back the Giants have had since Tiki Barber. Why would the Giants stop throwing the ball to their star Wide Receiver who holds 19 NFL receiving records? We all know that Odell Beckham can win games all by himself. Where is the Beckham slant, the Beckham pass to Barkley and the OBJ “stop and go”. Conspiracy or direction from the top: Stop winning. Put the players on the bench. Lose.